Eric Fanning scored a game-high 25 points and the Terriers shot a season-high 58.2 percent as BU coasted to a victory over Holy Cross in their final regular season tune-up before the Patriot League tournament. Seniors John Papale and Nathan Dieudonne were honored before the game as part of the team’s senior night. Dieudonne sat out his fifth straight game with an injury, and Papale finished with 16 points, including a three-pointer on his final shot before exiting to a standing ovation from the 1,237 in attendance. Following the game, BU coach Joe Jones offered high praise for his departing seniors. The ovation and warm embrace from his teammates and coaches was a special moment for Papale. Jones also spoke about the impact Dieudonne has had on the team this season. The injury-ravaged Terriers (18-13, 11-7 PL) had to use their fourteenth different lineup of the season. Despite the short bench, BU was able to clinch the third seed and a home game in the Patriot League tournament. The victory also avenged an earlier loss this season to the Crusaders (10-19, 5-13 PL). Papale’s 38 minutes broke John Holland’s (’11) previous school record of 4,195 minutes played. 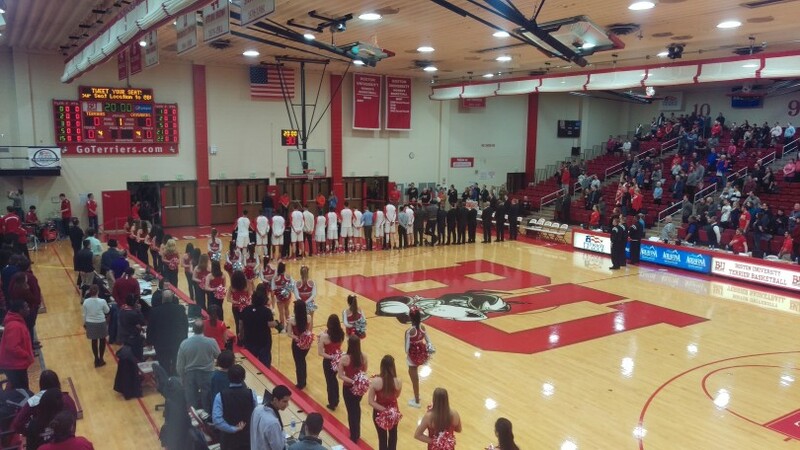 The Terriers also received big games from juniors Bliase Mbargorba, who scored a career-high 15 points, and Dylan Haines, who chipped in with eight points. The two big men combined for 11-11 from the field as BU outshot the Crusaders in the paint, 44-20. The Crusaders were led by Robert Champion who scored a team-high 14 points and seven rebounds. Karl Charles finished with 13 points, and Malachi Alexander and Cullen Hamilton each contributed 12 points apiece. HC got on the board first with a Charles layup right after the tip-off, but three’s from Papale, Fanning, and Eric Johnson keyed a 14-3 run that gave BU a lead it would never relinquish. The Terriers lead dwindled to three late in the first half, but HC was unable to get closer than six for the rest of the game. After Anthony Thompson and Champion converted on back-to-back threes to make the score 49-43 with 13:28 remaining, BU went on a 9-2 run over the next three minutes to put the game out of reach. With so many players sitting out with injury, the Terriers showed a lot of heart on Saturday. The Terriers will next open the Patriot League tournament at home against American on Thursday at 7 p.m. Despite the the mounting injuries, Saturday’s victory has Jones and his team optimistic heading into the tournament. “They’re excited right now, they’re excited to have a chance to play a home game,” said Jones.